It seems the better the book, the slower I read! This is counterintuitive perhaps, but I like to slow down and really—for want of a better description—gorge on beautiful writing. I finished Just Relations a few days back but have been so flat out with other things (and other books!) I haven’t had time to write a review. Just Relations is in many ways a product of its time. Published in 1982, and winner of the Miles Franklin that year, it is a longish book. In this regard it reminds me of books published around that time such as Midnight’s Children (1981) by Salman Rushdie, and Illywhacker by Peter Carey (a little later, 1985)—and I mean this in terms of length as well as style and quality. Great books transcend the time they are written in and are always worth going back to. 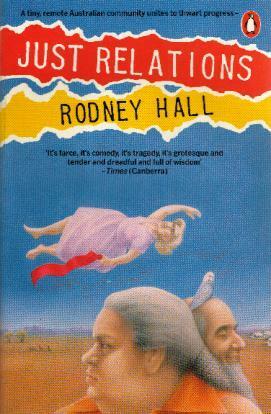 For lovers of quirky Australian tales with elements of magic realism that are beautifully written, Just Relations will not disappoint. 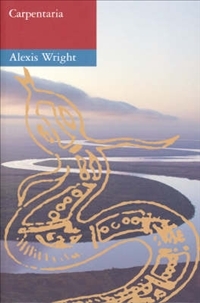 The by-line of the book is “A tiny, remote Australian community unites to thwart progress.” It is a good summary of the town of Whitey’s Fall which is built up a strange mountain of gold that looms over the town and its old folk who gather silently in the Mountain Hotel, (the pub), to muse over their ‘religion’ of ‘Remembering’. Billy leaves empty-handed and angry. He soon meets Vivien and a relationship blossoms between them after they witness the death in a car crash of Mrs Ping who drives off the Mountain road. And this is just the first one hundred pages or so! It is impossible to summarise the cast of odd characters that Hall has assembled here. They are as strange and quirky as the town. The story is full of comedy, farce, tragedy, and wonderfully unbridled imagination. There are many harrowing events; it seems Hall has a penchant for the grotesque things that people inflict upon themselves—or situations they wander into without warning. Mrs Ping’s death is one example. As is her husband “The Narcissist’s” razor-blade self-harm. What with the approach of the highway, what will the explosives in Whitey’s Fall be used for now? The highway roadworks uncover the gold, but only the townsolf notice. There is a lot of humour throughout the novel. In this section we see Senator Halloran attempt to rally support for the road. He says of the development that is cutting up the land: “Ecology is a web. This road will make you part of it.” How very droll! Strangely, I haven’t read a lot of Hall’s work. I heard him talk at the Sydney Writers’ Festival (2010) where he read from his just published memoir, Popeye Never Told You. In that reading he described a German bombing raid in WWII. The prose was sparse, haunting—and perfect for the subject. In Just Relations, the prose is both lustrous and weighty, a combination that may seem impossible, but Hall achieves it. I wonder how much the likes of Winton with all his ‘muscularity’ learnt from him? Whatever the answer, he is, on the face of this book alone, a worthy teacher. It might not reach the great heights of the works by Rushdie and Carey noted above, and here and there is perhaps a little indulgent—reflective of the time perhaps. But its imagination is no less exciting. It exhibits an intriguing range of narrative styles and voices. It turns out the price of progress can be quite high, yet it also brings love and the promise of a new generation. Just Relations kept me company for a while, and what good company it was! 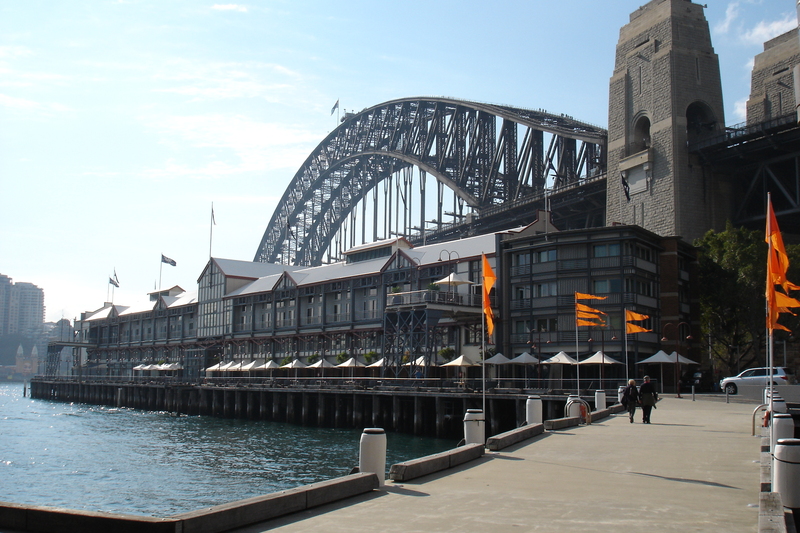 Wow, another great day at the Sydney Writers’ Festival. Even the intermittent rain couldn’t dampen the spirits of the many attendees. I went to three sessions today and thoroughly enjoyed each one. 1. ‘First Nation Stories’ – undoubtedly the highlight of the day, with Canadian, Richard Van Camp, a member of the Dogrib Nation of Canada’s North West, and Boori Monty Prior, from North Queensland, moderated by Anita Heiss. Richard spoke first and it was soon clear that this was to be an interactive session! He told us the story of how his people call the Northern Lights with whistling or rubbing of fingernails, and also how to ask them to go away with fingernails clipping the inside of one’s front teeth, and other methods besides. He said the lights have a distinct smell (dead fish!) and also a distinct sound (like bacon sizzling in the next room!). He told us that when he was young and people came around to his family;s house, his mother would say ‘Come, listen’ instead of ‘Go play’ – what a wonderful thing for a child! He was thus trained to listen from the earliest age, not just to words but to the silence between them – silences which are just as important than the words themselves. He told us about frogs (keepers of the rain: cue the first rain shower of the day! ), saying, ‘where there are frogs there’s clean water.’ He told us about mosquitos – kill one & ten others turn up to his funeral! – a message of violence begets violence. We heard also of the dragonfly secret he traded with a potter women in BC, and challenged us to remember all four lines, the last of which was ‘You need dragonfly wings for love.’ He also read his book Lullaby for Babies which a few years ago was given to every new baby’s family born in British Columbia. It was a highly entertaining talk. Next up was Boori (whose name means ‘fire’). He has worked for twenty years going around Australia and teaching aboriginal stories to school children and had some hilarious anecdotes of this journey. He also backed up Richard’s point about how children are the great teachers. He noted too that he believes stories are a way to save our country – we are far too keen to sell our native culture overseas and to overseas visitors, but how many of us non-indigenous Aussies know any people from this great culture? Boori also briefly explored the immense family tragedies that he has had to grow up with, and it is a measure of the man – and the power of stories – that he has not only survived such trauma but has lifted the spirits of so many with his stories. Indeed, the session itself was proof of the power of stories and story-tellers. If you ever get a chance to see either of Richard or Boori speak, do yourself a favour and go – and take your children with you! A great session. 2. ‘Family Fictions’ – with readings from four female authors from their respective works that each deal with families, their foibles and secrets. Larissa Behrendt read from Legacy, a book whose inspiration came from the tension between the generations in an aboriginal middle-class family. Alison Booth then read from her well-known Stillwater Creek, set in 1957 and delving into family secrets in a rural town where it seems everyone knows everything about others, but people always carry secrets. Kate Veitch noted before her reading the incredible small number of men in the audience – true! I thought I was the only one, but I think I counted two others! – and commented on how it is women who are the real backbone – not just of families, but of the book publishing industry too – well, that seemed to be true from the audience, but there are some men who read(!) She noted that ‘everyone experiences families differently, even siblings in the same family – a real truism. Kate then read quite a racy section from her work Trust. Last, but not least was Caroline Overington who had worked in journalism for many years and has written award-winning non-fiction before as well. She read from her pyschological thriller Ghost Child, a fictionalised story based on based on a really terrible crime and the affect it had on a girl whose sibling was murdered by her mother and her partner, with the girl and another sibling forced to watch. This occurred in NSW. It is an unimaginable event. The book is told in first-person from the point of view of its many cast members – an interesting way to get the varying angles of the girl’s life. 3. ‘Reading Muster #5’ – with Nada Awar Jarrar, Peter Goldsworthy, Rodney Hall, and Alex Miller, all reading from their most recent work – another interesting session. Nada read from her book which the moderator Melaine Ostell described as ‘a love letter to a city’ – that city being Beirut. Her reading explored some of the 2006 war between Israel and Lebanon. Next up was Peter Goldsworthy, who read a short story entitled The Nun’s Story, a riotously funny story about a boy being taught piano by a rather (at first) attractive nun. The boy smuggles in Womens Weekly magazines to the nun from his mother. Even the boy’s father fancies the nun, thinking ‘What a waste,’ as he drives the boy home from the lessons. The story ends with the nun trying on her ‘bible’ black one piece swimsuit – it is all very funny and highly recommended. Peter was asked about the length of his career (as all panelists were) and had some interesting points on the learning process that each piece of work brings, whether it is poetry, short story, novel, play and so on. For him, the learning never stops, but each genre and format gives him something to take to the next project, and skills are transferable across formats. Rodney Hall then read from his first memoir. Author of too many books to mention, including Miles Franklin Award winners Just Relations (1982) & The Grisly Wife (1994). I was particularly interested to hear Rodney as Just Relations had been recommended to me an author on Sunday after a discussion on Siddon Rock by Glenda Guest which I finished a few days ago (see my Siddon Rock review). Rodney’s memoir deals with fragments of memories he recalls from his childhood, and one of his two readings was from a bombing raid in WWII when he was a young child in England. He also spoke about what is important to his writing, and that is the voice. It is key. He talked about how each of his (14 I think!) novels each have a distinctive voice – particularly the seven he has written in first person. I had to steal away after this session, but there is plenty to look forward to over the weekend – except that usually benevolent Sydney sunshine, which seems likely to remain hidden behind plenty of rain. I’m sure the crowds will continue to find their enthusiasm hardy whatever the elements. What are your SWF highlights? Thoughts? Let me know!